K.S. I am very excited to have my own mother here today to talk about her book! *HUGS*. Why don’t we start off with a small introduction? Tell my readers a little about yourself. S.P. Hi Katie, thank you for the invitation to be interviewed on your blog. I am an active spiritual director, religious education teacher for both children and adults, and author of Where is God in Your Life? Three Retreats in Christian Spirituality. My vocation in the practice of spiritual direction supports lay men and women, as well as clergy and those in ministry formation, in discernment of God’s gifting and God’s calling. I have a master’s degree in Spiritual Formation from Regis University, in Denver Colorado. I am on the board of directors of Small Christian Communities Connect (SCCC), as well as being the chairperson for SCC in my local parish. 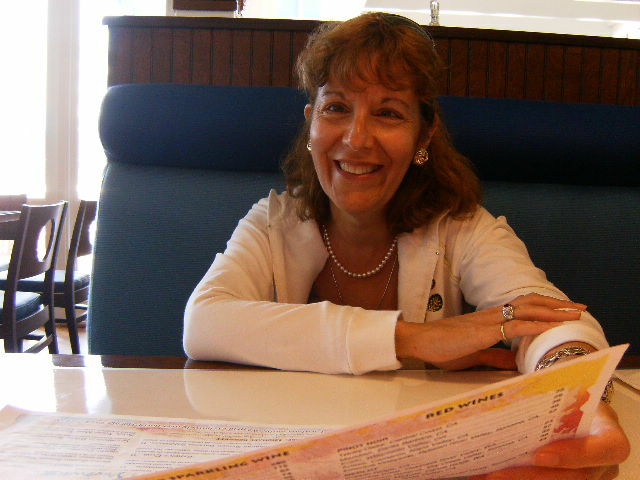 I write a daily blog about the message of Jesus on my site http://letyourlifesing.blogspot.com and I have a website http://sueprovost.com where I try to bring an awareness of God walking with us on this earthly journey. My desire is to share my understanding of God’s love with others, so they can experience what I have found in my own relationship with God. I feel that communication with God through prayer is the essential element needed to be able to see God’s movement in our lives. S.P. This is not the usual novel. It is a book that can give great hope. There are people who read it and want to run out and tell others about it, not because of my spectacular writing ability, but because it contains a message that inspires one to share it. The amusing thing is that someone like me, who in the past didn’t believe that real love existed, was able to be so totally taken up and transformed by a love that knows no limits. As I look back on my life, I realize that no human could have brought about this amazing transformation in me. There is no power on earth that could have brought me to this understand of love except the power of God. K.S. When did you realize you wanted to be a writer? What sparked the desire to pen your first book? S.P. I never actually decided to be a writer that just kind of happened as an outcome of my own spiritual journey. This was originally just a thesis that I wrote to satisfy the requirements of my Masters Degree in Spiritual Formation. It was after I had completed the thesis that my husband thought that it would be great if I turned that document into a book. S.P. My genre is basically Christian Spirituality. I define Christian spirituality as that which drives and facilitates our relationship with Jesus. S.P. The inspiration that has caused me to write is the love of Jesus and the desire to help others to experience that love. I would have to say that the book that has really changed my life is called “Portrait of Jesus” by Joseph Grizone. In this book, Grizone presented a picture of Jesus that is not really understood by the general population of Christians. By getting to know this Jesus, I developed a love for him that I have not felt previously. In all honesty, I learned about the true nature of love. Who could not love someone so powerful who gave of himself so completely to those who were powerless? I was blown away by the depth of his love and thus inspired to help others to see the love Jesus has for each one of them. The depth of this great love has caused me to devote my life to this ministry. It is a ministry of love. I make it a habit to give this book to those who are searching for an understanding of Jesus. This is not a complicated book to understand. S.P. My family has been very supportive of my writing and I truly appreciate that. S.P. I have been amazed at the reception of my book by friends. People who I thought would not be interested in what I had written were actually very interested. They have purchased my book to give as gifts, or to use as a meditative tool during the season of Lent or Advent. They have shared their own feelings about spirituality and God and their misconceptions regarding the message of Jesus. So far, I have not heard anything negative. I believe that there are a great many people looking for a closer connection to Jesus but are not quite sure how to go about fostering that connection. K.S. What inspired you to write your book? S.P. I suppose what inspired me was the fact that many people have a misconception of God. They believe God to be someone to be afraid of. This book is an effort to help people to unlearn some of the scary things we have been taught about God and to be introduced to the God of love. Our God is a God of relationships. However, you cannot develop a relationship with someone you fear. There must be an understanding that God loves us first. It is God who reaches out to us in relationship. But because of the many misconceptions that people have about God, we do not learn how to reach back. Also, most people don’t study Jesus or his message. They accept what the church tell them about him, but the understanding is not written on their hearts, only on their minds. Telling people about Jesus does not help people to develop a relationship with him. There is a process of learning about him, to discover who he was, what he said, how he treated people. I think that you have to know all of that and then to learn to pray. Most people do not know how to pray to God. Praying is conversation with God. There are many different prayer styles that go well beyond the simple prayers learned as a child. Just as you have to talk to someone to learn about them, you also need to talk to God. Jesus wants to share a relationship with us. You can share your feelings with Jesus as you would with your friend or loved one. S.P. The spiritual quest is not just one of many things we attempt to accomplish in our lives. It is our life. This reality, presented by spiritual director and clinician Susan M. Provost, in Where is God in Your Life? 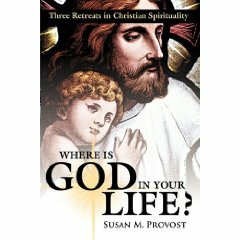 Three Retreats in Christian Spirituality (published by Trafford Publishing) outlines this spiritual quest as the goal Christians have committed to that encompasses their entire being. But once the decision to commit to Christ has been made, people may not know how to begin developing that relationship with Christ. Provost knows that quite often, people need to be given the tools necessary to develop a relationship with God and to understand how that relationship is celebrated in the community. Provost’s three two-day workshops are a program that will show readers and participants how to recognize God in their lives and to feel His love. The workshops help people to continue their spiritual journey to a greater connection with God and to see the importance of the Christian faith as a spiritual roadmap on the path to God. Provost’s program and book show how Christians eventually discover that success, productivity, and the constant drive to acquire things do not fill or satisfy the soul within us. “We burn out from what has become a road to spiritual death," Provost says. "We look for someone to convince us that we are of value for who we really are, not what we and our culture chooses to label us. We look for someone who we do not have to prove that we are worth something. We look to connect with the Creator, the Savior, and the Spirit of the God who loves us. Our soul yearns to make that connection and to feel whole, to feel significant, and to feel loved.” Where is God in Your Life will show you how. K.S. Where can we find your book? S.P. My book can be purchased on Amazon, Barnes and Noble and directly from Trafford Publishing. I also have my own inventory of books. So someone can contact me directly if they are unable to acquire copies from the other sources. S.P. I guess my final words are that one must put oneself in God’s hands and allow God to be the director of their life. If being an author is what you are meant to be, that is what you will be. As a writer, write from your heart. Write what you know about and what you are passionate about. Make a difference in what you write and place your life and your talents in the hands of God. I appreciate your spotlighting me on your blog. Thank YOU for being on my blog mom! Your writing is beneficial and gives food for thought. I hope that I'll have much more time to go through your content. Regards. I wish that you just publish new texts and invite you to greet me.